The front desk calls to tell me that the government has just issued an earthquake warning and everyone must move into the large hotel lobby. Her voice is shaking. I tell her that earthquake forecasting is highly inaccurate so she should not worry about it. Also, the hotel is 100 km from the epicenter and it has been already field tested by the M 7.9 event. I don’t think she believes me since she keeps knocking on my door and calling for me to get out. However, I ignore their warnings. I still need to write a report and get a couple hours sleep for tomorrow. Got down to the lobby and discovered that many guests stayed in the lobby till early morning to wait for the earthquake; which of course never came. It is good to be a structural engineer sometimes. We all slept a few hours last night; which is more than most nights. It is amazing what adrenalin does for you. We meet the NBC crew in the lobby of the hotel and are ready to go. We are heading to Hanwang, the Death Town, again. We stop over at a steel fabrication plant southwest of Mianyang. This building was built in 2003 and is a 1-story steel frame structure with steel cross bracing made of lattice plates. We are welcomed by a factory manager and we walk together into the factory. He is very grateful for our presence and he tells me that no one came to his mid-sized plant to check it out. As we expected, there is very little damage other than broken glass windows. The workers are still very scared and refuse to go into the factory causing production stoppage since the earthquake. Light weight steel structures always outperform unreinforced brick and nonductile concrete structures. We inform the manager that his building performed well and is safe for entry. He is very grateful for the news so he can pass this along to his workers. Hanwang must have been a very beautiful city before the M8 quake killed it last Monday. It is now a ghost town with acres of broken concrete and brick piles. The ground acceleration here must have been very high and the duration of the strong motion long to cause such incredible destruction. We park our vans. We walk into a deserted complex of 8-story residential buildings. These are all made of unreinforced brick walls and concrete slabs. We see a lot of diagonal shear cracks on the walls between windows, but the walls didn’t collapse. The diagonal shear cracks are caused by the lateral seismic force. These brick walls resisted the seismic force and protected the buildings from collapse. In this area, each room is very small and because of it, there are a lot of walls. The more walls that exist, the higher the seismic capacity of the structure. We have noticed that many old residential buildings performed well enough to prevent collapse. I explain these structural engineering basics to an NBC producer as we walk. I enjoy being a teacher very much. It is important for the public to understand why buildings perform well or why they collapse. We don’t see a single soul here, only a lonesome dog or chicken that has lost its owner. We leave the residential complex and enter an area of incredible disaster. We walk through a street where both sides are 20 feet high walls of concrete and brick piles. We arrive at a school that is 80% collapsed. This was a 4-story school built in 1994. These school buildings are very weak against seismic forces. We’re finding that many of the “total collapse” buildings are schools. These buildings have very little strength and ductility, which is a measurement of a building’s seismic energy absorption capacity. If there is enough steel with proper detailing, concrete or brick can possess high ductility. Again, I see precast concrete planks hanging by a thread against the black chalk boards. These planks were the floor… or they used to be. When the columns or walls supporting these planks gave way, the planks dropped with the kids on them. And the planks above fell on them… It is really sad to see the black boards with fresh chalk writings and framed pictures of the student body still on the walls. I can’t imagine the horror these little kids and teachers must have felt when the floor above and below them suddenly gave way. As structural engineers, we have a responsibility to prevent these disasters. I must say, as a profession, we fail the public we are supposed to protect when buildings collapse. There are dangerous buildings everywhere on earth. You will find plenty in the US, Canada, Japan, China, South America, Eastern Europe, Southeast Asia… Unless we speak out, we will see these tragedies many more times in our lifetimes. We must take a leadership role to communicate and educate the public. It is a very important task. Our loved ones’ lives depend on it. Next to the school, I see a dormitory building. It is similar in construction to the residential building I described previously. It is all cracked but is still standing just fine. I believe most of the kids were able to escape from this building. By the way, this is the intent of most building codes worldwide – life safety. A structure may experience major damage during a strong earthquake, but it doesn’t collapse. Based on this principle, this building performed well. An NBC cameraman climbs up a 30 ft high pile of concrete to take a few shots. Let me tell you that all the journalists I met here are dedicated, brave and a crazy bunch. They are in the field all day and they work till early morning editing and communicating with headquarters. The working condition is horrible. We are constantly covered with dust, chemicals and sweat. Added to this is the constant danger of aftershocks and potential disease outbreak. Whether you are a journalist or a structural-earthquake engineer, our jobs are not for everyone. I am really glad to have them with us to record the facts. We find a one-story industrial building fully intact in the middle of the devastation. Again, it is a light-weight steel structure, but it is totally abandoned. The structure performed well but the business cannot function without workers and surrounded by collapsed buildings. Again, anchored equipment have slid off the base. Nearby is a 3-story concrete office building without damage except for the wood roof. It has a plenty of walls and appears to be a well designed structure. Yes, good design pays off and saves lives. We see an undamaged concrete water tower. This structure has a natural frequency that is different from the buildings in this area. It is much more slender and has a lower frequency; which may have help it survive high accelerations. Also, the shape and weight of the tower requires good concrete reinforcement and a strong foundation, resulting in good performance. As we walk back to the vans, we see a different complex of residential structures. One of the buildings has a big gash down the middle of the structure and is leaning to one side. Upon closer inspection, we discover that the ground floor brick walls have totally failed and pancaked the ground floor. At least four of these buildings failed in the same way. For the people on the ground floor, there was no chance of survival. Looking at one of the only surviving buildings, I notice that there are few walls to resist seismic forces. It’s mostly windows; which provide no seismic protection. There is Chinese writing in red paint on the outside wall. Rocky tells me that it means there is a dead body buried at the point where the arrow is. We get in the vans and head back to Chengdu. We drop by a small village near Hanwang. As soon as we get off the vans, we are swarmed by villagers asking us to examine their houses. The buildings in this town are mostly compact concrete structures. There is no collapse and most of the buildings have no damage. But the families are sleeping in tents anyway. We investigate a few buildings, and mingle with the people. I enjoy interacting with the locals. People here are probably one of the most polite and friendly group of people I’ve ever met. By watching smiling kids, a hard day melts away quickly. We meet with a group of business men and a government official who are concerned about earthquakes and how all of the negative implications will impact domestic and foreign investment in this area. They invite us to a traditional Sichuan dinner. We tell them that with proper risk management and good structural engineering, it is possible to mitigate the earthquake risk. Investors should be informed of structural and insurance options to protect their investment. Dinner is great but I’m not certain if my colleague Chris is crazy about the idea of eating sea cucumber. It’s nice and soft… a delicacy. I like it. This is the last day of our trip. NHK called and asked to go back to the first middle school in Juyuan Township that we visited on the 18th. NHK wants to do a detailed investigation of the school building for a 90 minute special this Saturday. It is a hard decision since we want to cover as much area as possible. We decide to go along with them. It is a good thing for the public to know what makes building dangerous. We drive off in two vans. The NHK crew provides lunch; which is a piece of bread and orange juice. We don’t eat much during the day because there is just no appetite. With so much destruction, suffering and death, no one is in the mood for a picnic. We drive into the town of Juyuan; which is fairly close to the epicenter. Walking around, it is evident that the earthquake forces were very much focused in one direction here. Diagonal cracks are found along walls oriented in the same direction for many buildings. We walk into the grounds of the middle school. I feel like I just came back to the nightmare that I can’t escape from. Today, the ground and broken building are covered by white disinfection powder. It looks like fresh snow covering a grave yard. We walk through the site and examine the twisted concrete and broken bricks to better understand how the building was constructed. NHK provides us with a hand sketch and a picture showing the original state of the school. A client has requested a structural survey of their damaged industrial facility. We have to split the team. Chris and Rocky go to do the survey while I stay to continue the investigation with the NHK crew. They have to drive 5 hours to get to the site. The road conditions and our van’s shocks are not good. This will be a hard trip for them. It is kind of strange to say ‘good bye’ to them. We’ve gone through a lot together in the last 5 days. At first glance, I thought this was a concrete frame building. I see broken concrete beams and rebars on the ground. I can see concrete frames in my mind. But we can’t find any concrete columns. The only concrete items we find are the precast floor slabs and concrete beams. After 30 minutes of study, I finally realize that these concrete floors are supported by the bricks without any reinforcement. This is basically an unreinforced masonry (URM) bearing wall structure. The stair structure stands alone. I saw this a lot during this trip. Cast in place stair structures turned out to be the safest place in the school buildings. I heard that children who happened to be in the stairways survived. As demonstrated by earthquake after earthquake, URMs are one of the most dangerous forms of construction. Just imagine building a Lego house, but using Lego blocks that have no protruding nubs to tie the Legos together. This Lego house would not be able to resist lateral shaking. The school building is like these weak Lego houses. 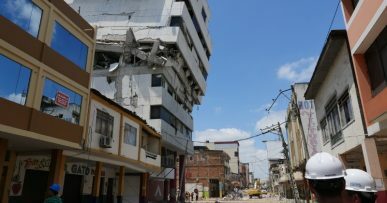 To resist earthquake forces, buildings must be designed to support the gravity (vertical) and seismic and wind (lateral) loads. The precast floor planks of this school simply rested on the concrete beams. There is no positive mechanical connection between the slabs, or between the slabs and beams. There is also no structural cast-in-place topping concrete slab to tie together the planks and the beams. The beams simply rested on the brick bearing walls without any mechanical connection. Large windows in each classroom further reduced the amount of walls available to resist earthquake forces. These narrow brick bearing walls made for a more deadly combination. Between the classrooms are solid brick interior party walls. As noted earlier, if there are many of these solid walls, a building may survive even when the walls are made of unreinforced brick. The surviving lab building nearby has similar brick party walls that happened to aligned with the predominant earthquake ground motion direction. I found a single large, diagonal crack at the ground floor wall. This wall is oriented in the same direction as the walls of the retail buildings that I described earlier. Had the strong ground motion been in the perpendicular direction, this building would probably have collapsed as well. This earthquake was generated by the nearby Longmenshan Fault, a thrust fault. From the pattern of wall cracks, it appears that the large pulse projected from the fault was perpendicular to the fault line; which runs northeast. So in this area, if a building had many solid walls aligned perpendicular to the fault, it had a good chance of surviving without collapse. But if the walls were narrowed by many door and window openings, a building had no chance. Unfortunately for these 700 kids, the windows ran northwest. The neighboring dormitory building survived, but with many shear cracks in the walls. This is similar to the surviving apartment blocks we saw yesterday. With small dormitory rooms, the building had many, many walls to resist the earthquake forces. I describe the above information to the camera. The truth needs to be told. Unreinforced masonry and non-ductile concrete structures again killed many thousands. We finish the taping. I need some time alone and walk around the white powder covered field. I see a man who is at the top of the rubble. He is digging and removing the twisted steel rebar and concrete with his bare hands. There are tears in his eyes. There are still 20 kids missing in this place. I see a pile of kids’ backpacks. A couple of women are searching for their children. They are very upset but determined to find closure. 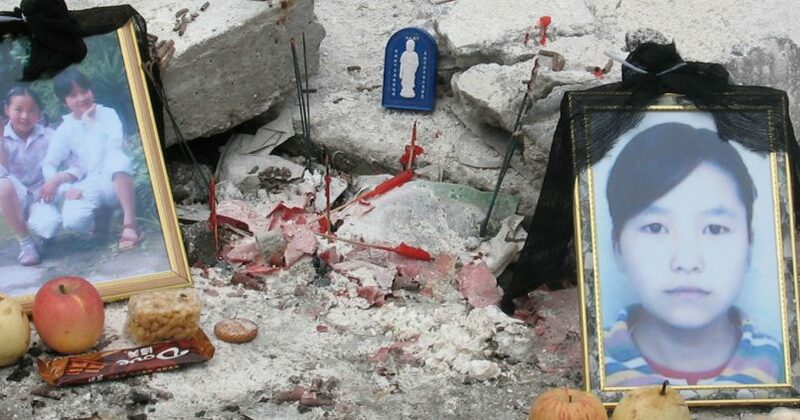 Next to the rubble, I see two pictures of young girls in a simple memorial. Nearby is a small tape recorder playing the same Chinese chant that we heard a few days ago. This must be a prayer of some sort. I kneel in front of these pictures for a while. I can’t stop crying. I am now back at the hotel to meet Professor Wada from Tokyo Institute of Technology. He is my doctoral research professor. It is nice to see a friendly face. 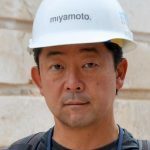 Professor Wada is one of the most eminent earthquake engineers in Japan. He will be the first engineer from there to visit this earthquake. I’ve been told that our team is the first foreign engineering team to study this earthquake so far. Throughout this trip, I found the Chinese government to be very open, organized and competent. 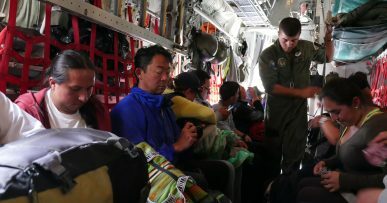 I saw the Army, medical personnel, search and rescue teams, demolition and clearing crews, and disinfection specialists working together rapidly. Our TV station friends reported that they had no difficulty at all with performing their activities. Technically speaking, our findings reinforce old lessons – unreinforced brick, non-ductile concrete, and building elements not well tied together are dangerous combinations in earthquakes. Unfortunately, this lesson is repeated over and over again. This is not a China issue alone. We must retrofit these dangerous buildings worldwide, including those in the United States, Canada, Central and South America, Japan, China, South East Asia, and Eastern Europe. If we do this, then the 70,000+ lives lost here are not wasted. We owe it to these children who died underneath their schools.